Ready for unconditional love? Let Nature nurture you! Find out how to interpret Nature’s messages that will fill you with heath tips, awe, inspiration, and healing. This fascinating book combines ancient wisdom with modern research, imagination with science, and has profound answers from your mom—Mother Nature. After four billion years experience, she has life figured out. Empowering exercises throughout the book will inspire a greater love of yourself and the planet. What’s different about your book, Nature’s Secret Messages: Hidden in Plain Sight? It’s not a nature book in the sense that most people think of nature books, as photos of the forests, mountains, and sea. It’s entirely different from all other nature and health books, because it presents nature as your nurturer, health coach, and mentor, in an easy, informative manner that’s fun to read. Mother Nature is always speaking to us . . . but in what language? When we learn how to discern her secrets, a world of information appears that can help us live healthier, happier, and more balanced lives. Nature has four billion years experience to share with you, and is right outside your door and free! You’ll discover how to . . .
• See nature in a whole new light. Elaine presents great ideas with a rare combination of fact, humor, insights and practical concepts to get better results. • Come away inspired with new ideas that benefit you, your loved ones and the planet. Receive wise guidance from your mom—Mother Nature! We can take advice from motivational speakers who have been around maybe 50 years versus Nature who’s been around 4 billion years. It’s time we learn to listen to our mom—Mother Nature, who really does know best! 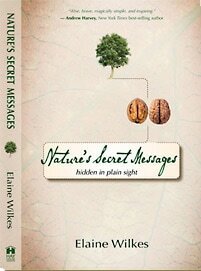 The book, “Nature’s Secret Messages” is full of exciting mysteries and don't we love a mystery! Enjoy the intrigue and fun of unraveling the clues hidden all around us. When you stop, look, and listen to Nature and uncover her many “mystery novels” you’ll never view nature or food in the same way again! Get ready to see magic everywhere. My sincere wish is that Nature becomes your true friend and mentor, and that this book fills you with many “awe-ha” moments. Mother Nature’s profound wisdom is right outside your door and is free! • Awarded a rare star recommendation from well respected Publisher's Weekly, which is a a top honor! Above is review from New Age Retailer Magazine. With a dash of tongue-in-cheek cheer, actress and PhD-carrying naturopath Wilkes offers a thorough, clear-cut and well-illustrated introduction to holistic medicine, natural eating and the benefits of mindfulness. Part I deals with the physical similarities between people and food, emphasizing the ease with which we can sense, literally, the health benefits of different foods: English walnuts, which contain brain-supporting omega-3 fats, physically resemble the brain with “two equal sides,” a “hard protective shell,” and “furrows,” as well as a similar fat content (68 percent). Part II deals with emotional and mental well-being, starting with water’s lessons for curbing stress, from taking baths (“its healing properties… [are] endless”) to assuming the “waterfall pose” (back flat on the floor, legs up against the wall) for 15 minutes twice a day. The third part deals with spirituality and mathematical complexity in nature (the Fibonacci sequence in plant structure, the hexagonal shape of bee hives, etc.). Part IV deals with food, drugs and deception, and an appendix provides ample resources for the budding naturalist. B&W illustrations. It was Albert Einstein who said, “Look deep into nature, and then you will understand everything better.” With this guiding principle, Wilkes introduces many easy ways to connect with and draw guidance from the natural world around us. By giving thoughtful consideration to the soil we stand on, the foods that sustain us, the rhythms around us, and the sensations within us, Wilkes helps the reader develop a richer relationship with Mother Nature, giving us eyes to see what we never saw before. Laced with humor and wit, the book teaches readers to recognize the life-giving benefits of various plants. For example, English walnuts, rich in brain-supporting omega-3 fats, bear an uncanny resemblance to the brain itself. Nature is full of correlations like this, and Nature’s Secret Messages brings them quickly into focus. By addressing several dimensions of the human experience (our physical needs, emotional and mental well being, spiritual development and more), the book integrates many layers of nature-based wisdom. 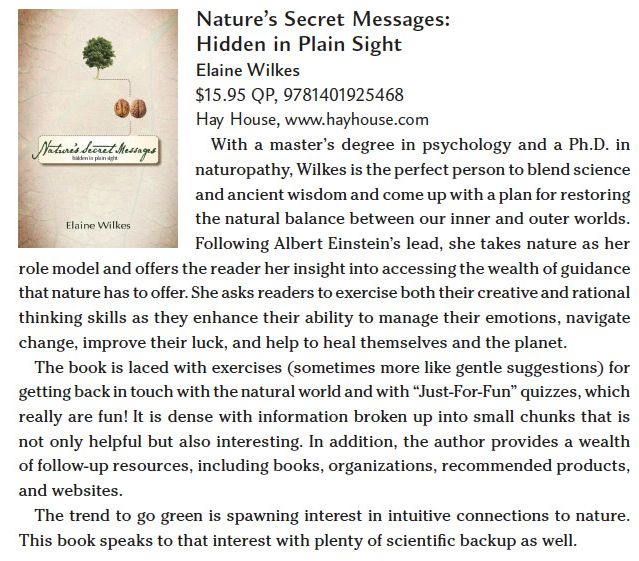 Well researched and easy to read, Nature’s Secret Messages is brimming with facts, resources, and “awe-ha” moments. Without a doubt, this book will change the way you see the world around you, the choices you make at the grocery store, and your relationship to the forces that sustain you. Are you ready to take Eco-awareness to a whole new level? What a joy it was to read this book filled with insights and information about the world around us that we just don't see and yet it is all around us. For anyone who loves the environment, excellent health and is open to new ideas, you will not be able to put down this book. -- Should be in everyone's library.